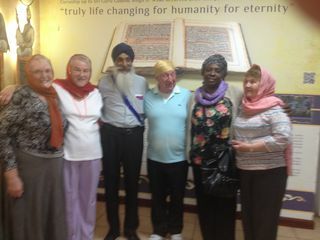 On 16th June members of the Fed visited places of worship as part of our 'Bringing people together' project under the grant from the Near Neighbours programme. We went to the Shiri Krishna Mandir Hindu Temple on the Penn Road and then to the Guru Teg Bahadur Gurdwara at Upper Villiers Street. The visits were organised by Jaswinder Chaggar from the Wolverhampton Inter Fiath network. We are now planning to visit St. Peter's Church on 1st July.